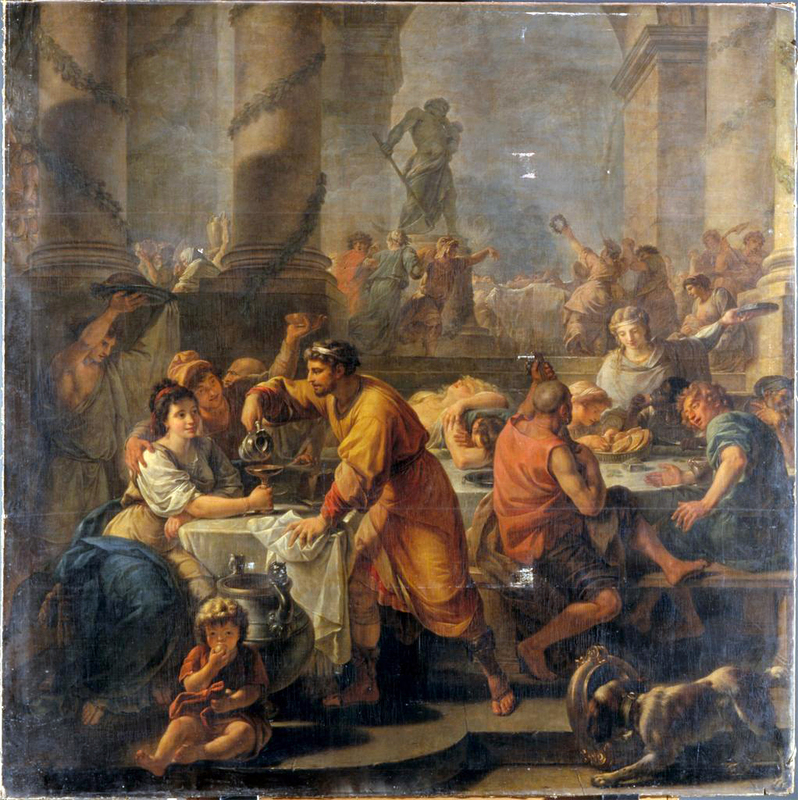 In 336, the Roman Emperor Constantine inserted a celebration of Jesus Christ into the fun and frolic of the Saturnalia, a festival dedicated to Saturn held annually from December 17-23. The holiday included great feasts, gambling, gift giving and a once a year role reversal where Masters would become Servants. It’s hard to know why Constantine chose this particular event to sanctify Jesus Christ into the Roman calendar. Perhaps he was making an allegorical point on how a servant had now become a master. In 337 AD, Julius I, the newly appointed Bishop of Rome, gave the holiday it’s own date, December 25th. This was also the birth date of the Sun god, Mithras, a Persian god very popular with the Roman Military. The Roman Empire was falling apart. The boundaries were too large and the population too diverse. Constantine thought he could re-unite the people under one religion. His mother, Helen, was devoted to Jesus Christ but his military was devoted to Mithras. It was a very hard decision, but in the end he chose Jesus. I guess he was a Momma’s boy all along. And so, December 25th, 337 AD was the first Christmas, and the first Christmas in the city of Rome. In Rome the holiday begins on December 8th, the date of the Immaculate Conception of the Virgin Mary. However, wherein the holiday pretty much ends the day after Christmas in most of the world, in Rome, the festivities continue through January 6th, the day of the Epiphany, when Jesus Christ was visited by the Three Wise Men (Magi) and baptized by John the Baptist. Christmas Tree or Fertility Rite? The Vatican Christmas Tree arrives to St. Peter’s Square in early December. This is a relatively new tradition in Rome. 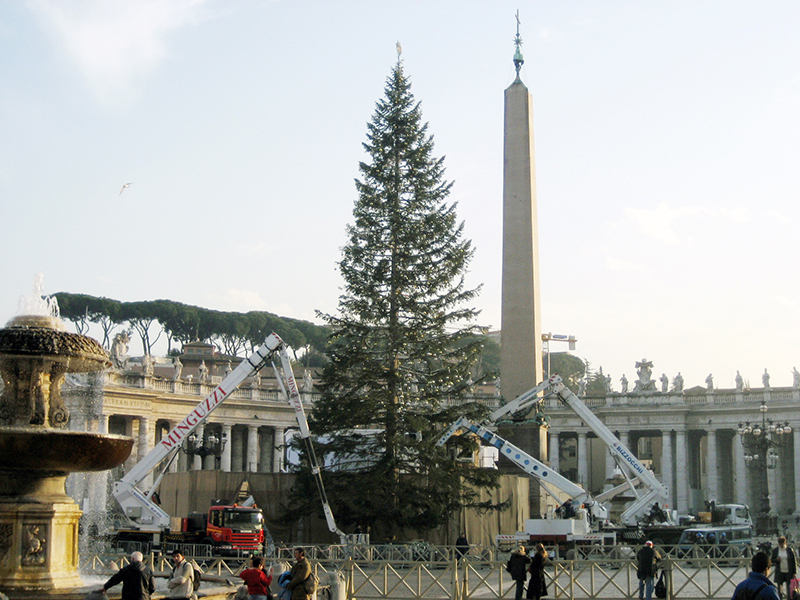 Pope John Paul II wanted to bring a part of his Polish Christmas roots back to the Vatican and in 1982 he imported a Fir tree from the Alban Hills, about 12 miles southeast of Rome. There has been a Vatican tree ever since. The trees vary in height from 52’ to 110’ tall and come from all over Europe. This year’s 82’ tall Spruce arrived on a flatbed truck from Bavaria. It was decorated with recreations of designs made by Italian children suffering from cancer. The tree lights are illuminated on December 18th. 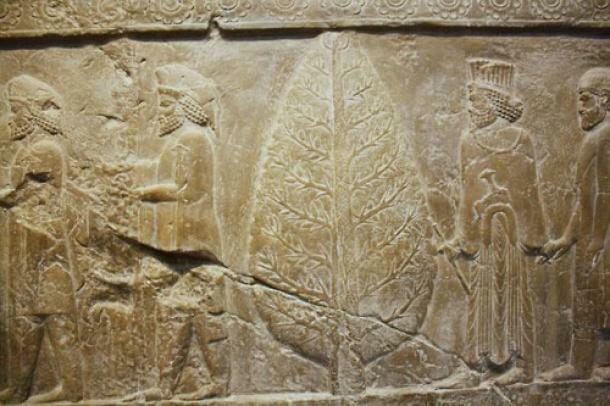 Evergreen trees have been used in winter festivals since 600 BC (at least) when the Persian Empire included the tree in the worship of the Sun God, Mithras. Pre-Christian Northern European cultures believed Evergreen trees had magical properties to restore health and promote fertility. Boughs were brought into the homes and decorated and worshipped during the Winter solstice (December 21st). In the post-Christian world, till the end of the 17th century, tree worship was considered paganist, idolatrous and generally not acceptable in the Christian way of life. Decorating your house with a tree in the Puritan times of early America was a punishable crime. 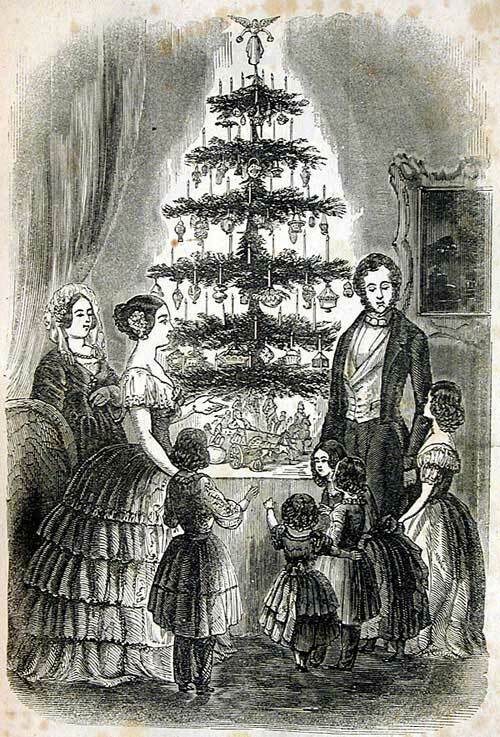 However, all that changed when in 1848 when the Illustrated London News ran a woodcut drawing of Queen Victoria and Prince Albert gathering their family around a decorated Christmas tree. 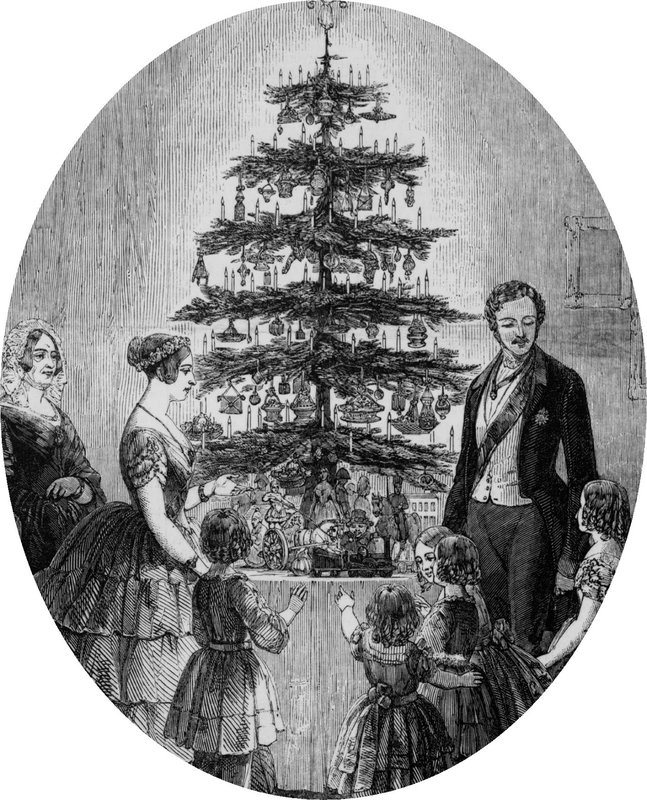 Albert’s German heritage had decorated trees for years and when he came to live in England, he brought the tradition with him. The 1848 London News edition found it’s way into the hands of Sara Josepha Hale, the editor of Philadelphia’s The Godey’s Lady’s Book. 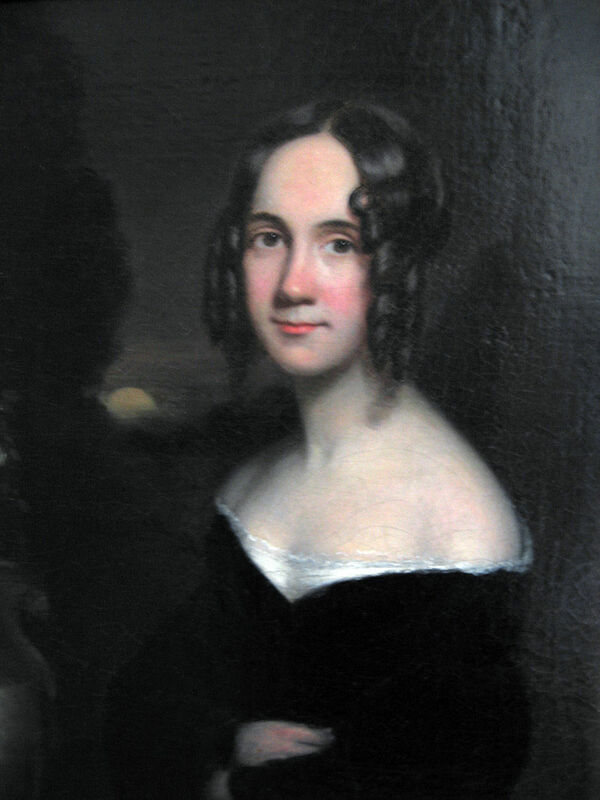 Sara Hale was America’s first Holiday Enthusiast, kind of a mixture of Hallmark Cards and Martha Stewart. Her run as the editor of Godey’s Lady’s Book lasted 40 years. It was during this time she wrote several books of poems, a few novels, penned the song, ‘Mary had a little lamb’, convinced Abraham Lincoln to create the Thanksgiving Holiday, and started the tradition of the Christmas Tree in America when she appropriated the Illustrated London News woodcut and altered it to fit American tastes. After she ran the photo in the 1850 Christmas edition of the Godey’s Lady’s Book monthly, Christmas trees became the must have for all American families. 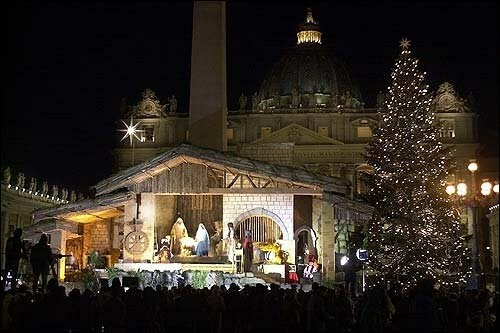 When Pope John Paul II brought the tradition of the Christmas tree to St. Peter’s Square, he also included a large nativity scene, which has also become a yearly tradition. 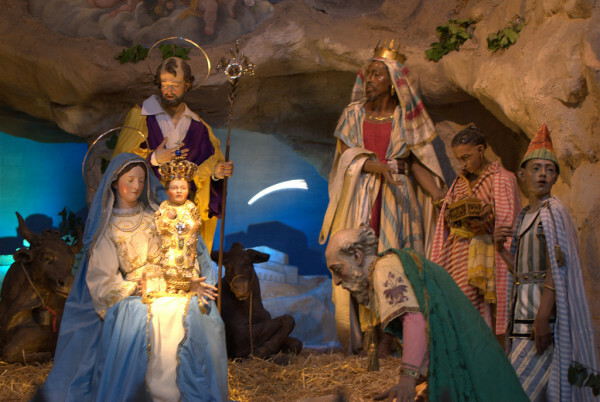 This year (2015) the Nativity will include 100 figures from the Basilicata region of southern Italy. The terracotta figures are crafted by Francesco Artese, one of the most famous of the southern Italy schools of traditional nativity scenes. In Italy, the nativity Scene is called a Presepio, the Latin word for manger or crib. 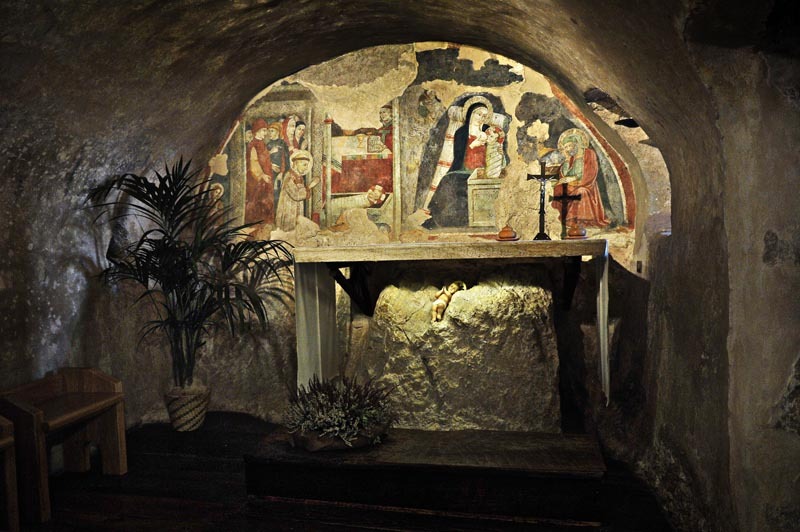 The 1st Nativity Scene was created by Saint Francis of Assisi in the year 1223 when he had a manger assembled in a grotto near the hill town of Greccio, about 100km northeast of Rome. Francis employed actors, animals and even a baby to play the baby Jesus. It was during the times of the Christian crusades in Jerusalem and out of concern for the lives of the Pilgrims voyaging to the Holy Land, Francis created the grotto as an alternative place to offer prayer. A fresco of the event was painted by Giotto between 1290-1295. 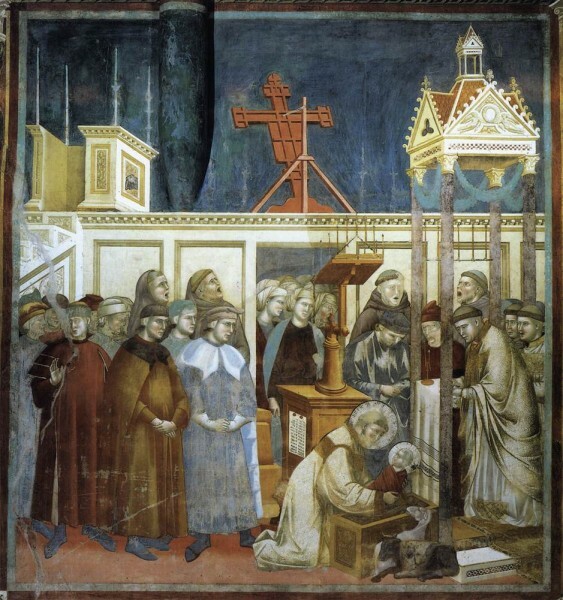 The fresco still exists in the upper Basilica of Saint Francis in Assisi, Italy. The grotto still exists and, of course, it has become a holy place of worship. The town of Greccio recreates the original Nativity scene at the site every year. 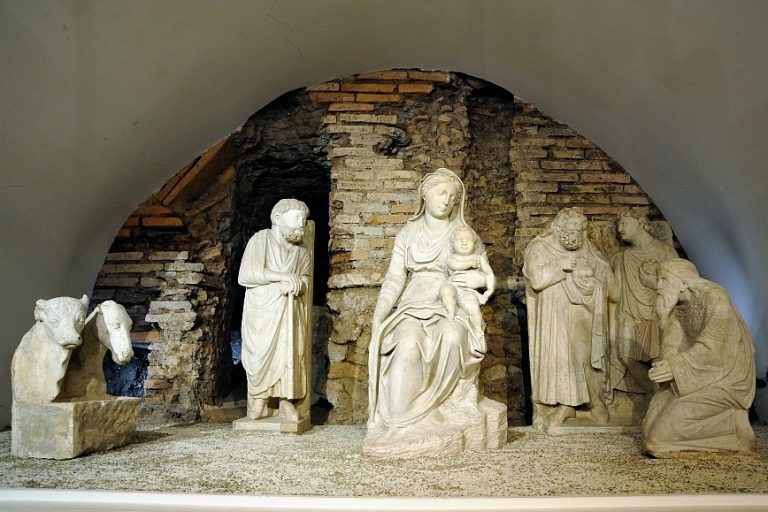 Although Naples is often considered the origin city of Nativity figurines, the first nativity figures were actually carved by the Tuscan artist, Arnolfo di Cambio in 1280. They are still in great condition and on display in the crypt of the Rome’s Basilica of Santa Maria Maggiore. The original pieces include Mary with child, Joseph, a donkey, a cow and the Magi. Naples became the Presepi Capital of Europe in the 16th century. The city still produces the best figurines (in my opinion) in the world. For well over 10 generations, Neapolitan families have handed down the art form to their children. For well over a hundred years, the shops along the Via San Gregorio Armeno have been filled with traditional and contemporary figurines, models of old taverns and barns, country scenery and lately, contemporary additions. 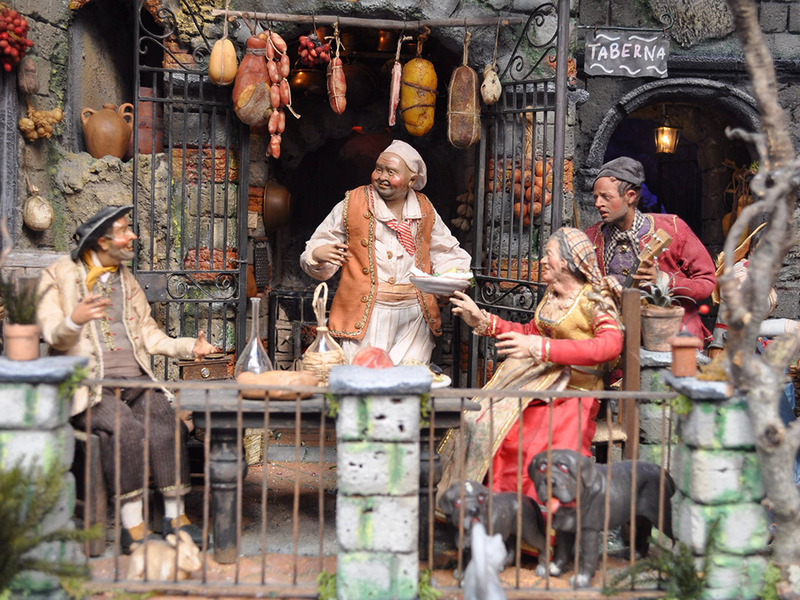 The classic Neapolitan Presepio includes the usual biblical characters, Mary, Jesus, Joseph, the Wise men and barnyard animals, but the scene was re-enacted into a 17th or 18th century Neapolitan atmosphere. These days the figurines range from classical to contemporary to downright silly. Yes, people have put Politicians burning in hell, Elvis and Steve Jobs and favorite Sports personalities into their Christmas Nativity scenes. When Charles VII of Naples became King Charles III of Spain in 1759, he brought the Nativity art of Naples with him. The Neapolitan figurine artists were now in a larger arena and now sought after throughout Europe. The 18th century was the Golden era of Naples Nativity art. 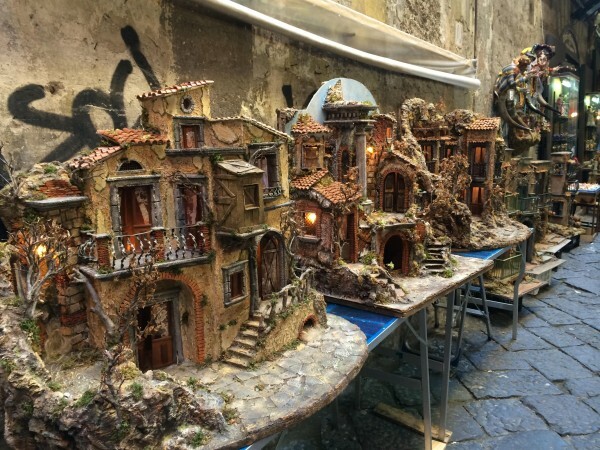 Christmas is the best time to visit the Via San Gregorio Armeno in Naples. The narrow street gets so crowded it’s hard to maneuver your way through the originals, the cheap fakes and the pickpockets, but it’s well worth the visit at least once in your life. Presepi (Nativity scenes) fill every church in Rome for Christmas, and there are a lot of churches. They start getting assembled on December 8th. The baby Jesus doesn’t arrive until late Christmas Eve, the Three Wise men don’t make it into the manger until the Epiphany. The scenes can get very involved. Some are mechanical, some have extensive lighting systems, some include live actors. The prize for having the most wonderful Presepio was a visit from the Pope who would place a veil over the face of the Holy Virgin to show he was there. If you want to get submerged in nativity art, Rome’s 100 Presepi Exhibition is a good place to visit. This annual show that takes place in the Sale di Bramante, (next to the Basilica of Santa Maria del Popolo in Piazza del Popolo). Some of the nativity scenes go back to the 16th century. The Exhibit is from the end of November through the 1st week of January. There are also lots of places to see impressive Presepi without the price of admission. 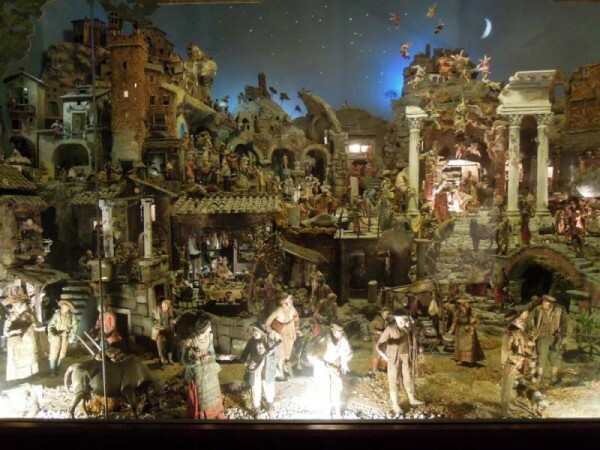 Aside from the Vatican nativity scene, the second largest one in Rome is a traditional scene known as the Presepio Pinelliano di Trinità de Monti. Based on the sculptures of early 19th century Roman artist, Bartolomeo Pinelli, this theatrical set is constructed on the Spanish Steps near the Church of the Santissima Trinità dei Monti. Another amazing scene, known as the Presepio Napolitano del ‘700, is an immense 18th century village that has occupied a room in the Church of Cosma and Damiano (near the Roman Forum) since 1940. It’s to the right after you enter the building. This one can be seen year round. This you tube video is from 1940 when the Presepio was installed. It’s in Black and White but it gives a good idea of the scale that includes ancient Roman temples, biblical saints and dozens of 18th century Neapolitan figures all having a merry ole time under a starry sky. Unfortunately, these days, the great scenic village is behind glass. A few years back, someone stole the baby Jesus. They got him back, but now there is a security system and glass partition. All things needed for modern times. Some Nativity scenes in and around Rome employ live actors. 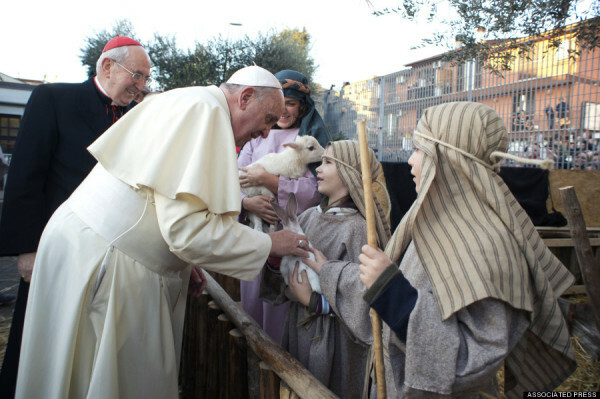 In 2014, Pope Francis made a visit to the live Presepio at the Church of Saint Alfonso Maria dei Liguria in the outskirts of the city, a reenactment that included more than 200 costumed actors. Although Rome has tried to keep Christmas values traditional, local shops have discovered the boon of seasonal profits and Children have discovered the joy of gifts. The concept of Babbo Natale (Italy’s Santa Claus) didn’t really arrive in the country until the 1950’s. When the Coca Cola Company introduced the fat, jolly gift giver in the red suit in the 1930s, American spirit of gift giving was officially hijacked by the commercial corporation. Christmas was no longer a holiday of religious respect. In many way, it starting reverting back towards its roots in the Festival of Saturnalia. 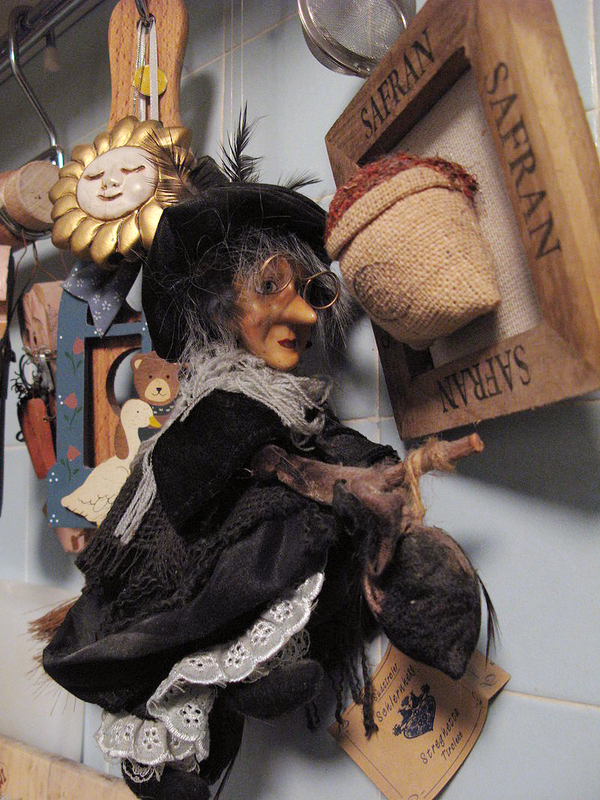 Prior to Babbo Natale, the big holiday gift giver in Italy was an ugly, Disneyesque witch known as La Befana. As the story goes, when the Three Wise Men came looking for the manger they stopped at the house of La Befana and asked directions. She was too busy and brushed them aside with her broom. Later she realized she made a mistake but when she went to look for them they were gone. And so now she spends every January 6th (Epiphany) looking for good and bad children. The good kids get gifts and sweets. The bad kids get lumps of coal. 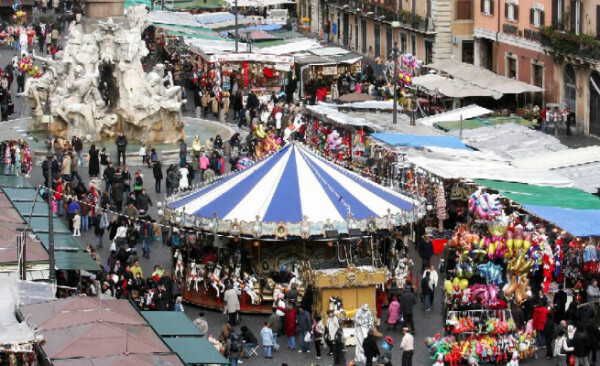 From early December through January 5th, Rome’s Piazza Navona transforms into the Mercato della Befana, a carnival of rides and booths filled with Nativity figurines, La Befana dolls, sweets and candy coal. Rome is attempting to bring back the old traditional market feel. This year less than half the booths were approved and the quality of the items must follow certain rules. It could be the end of Mylar balloons and carnival rides. 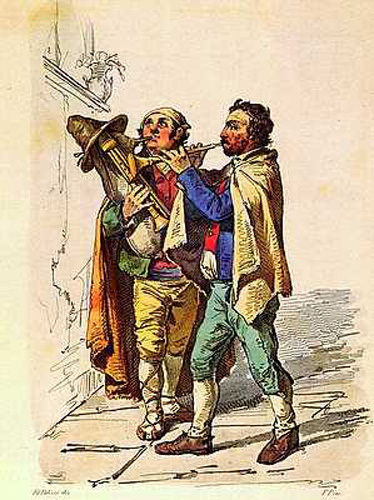 These sheepskin clothed bagpipe and flute players come from the Abruzzo Hills to Rome and play in the streets of Rome for Christmas in exchange for food and/or lodging. It’s a Christmas tradition that’s been going for hundreds of years. According to some of them, Zampognari played their pipes for the baby Jesus in the manger. If you meet them, it is not good luck but it’s a lot of fun. This a video from Canale 25 will show you exactly how they look and sound. The video is from a Zampognari visit to the Mercato della Befana in Rome’s Piazza Navona . For the Christmas feast, Eel is what’s for dinner. The big Christmas dinner in Rome happens on Christmas Eve. The meal builds up steam, starting with a fish broth, followed by pasta with tomato and tuna sauce or boiled cod with onions, tomatoes, pine nuts and raisins, followed by a fritto misto of fish and vegetables, followed the piece-de-resistance, il Capitone, the Christmas Eel. You can have it fried, roasted, marinated or baked. The eel’s similarity to a snake represents the victory of good over evil. The birth of Jesus represents the Good and the eel represents the evil, or so the legend goes. Housewives used to buy live eels and keep them in the bath tub, kind of like Americans buying live lobsters. And yes, there are many stories of chasing the eels around the house. These days they come prepared for the oven from your local fish store. Desert will always include the Christmas Pangiallo, a yellow cake filled with dried fruit, candied orange peel and honey. 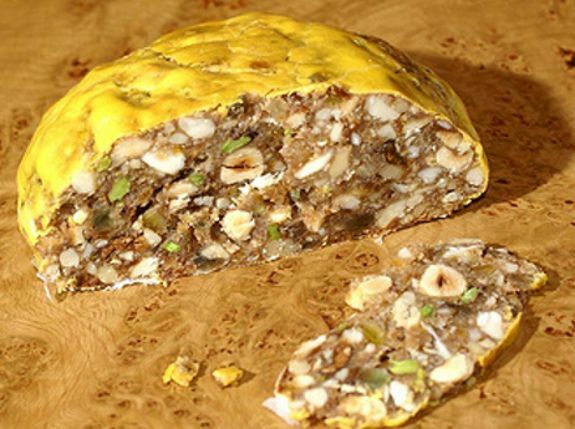 Other Italian fruit cakes like panettone, torrone and panforte and pan d’oro have also become popular on the Rome Christmas table. After dinner, around 9pm, the faithful start the journey to their favorite Church for Christmas Eve mass. You can visit any Church of your choosing and there are hundreds of them. The largest, of course, is with the thousands in St Peter’s Square. The bigger ones have more pomp, the smaller ones are more personal. Some will attend the Midnight Mass in St Peters, along with the other thousands of people. One of the most popular Churches on Christmas Eve is the Basilica di Santa Maria in Ara Coeli on the Capitoline Hill. The big prize here is the appearance of the Santo Bambino. He’ll be who will be placed into the Presepio at midnight. 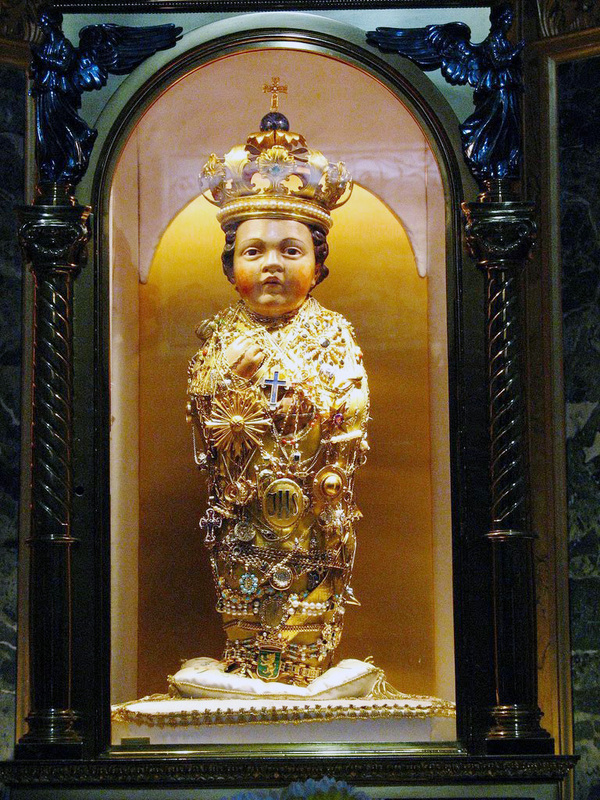 The original life-size statue of the baby Jesus had been performing miracles for hundreds of years. The olive wood statue was carved in the 15th century by a Franciscan friar living in Jerusalem. According to the legend, the wood came from a tree in Gethsemane and the final details were painted by the hands of angels. When the sick would call, Santo Bambino his staff of administrators would come in a gilded gold carriage. He was resplendently dripping in jewels, tokens of thanks from those he has healed. The more jewelry he had, the more the sick were healed. He was stolen in 1797, during the Napoleonic occupation, but returned after a ransom was paid. Then, in 1994, the Bambino was stolen again. This time he never came back. A copy was carved to take his place. During the year Il Bambino II sits inside his glass alter in the back of the Church. He doesn’t make house calls anymore. He only comes out for Christmas and Epiphany. One last thing to note. The weather in Rome around Christmastime is pleasant and sunny with highs in low 60s F (16°C ) and lows in the high 40s F (6°C). 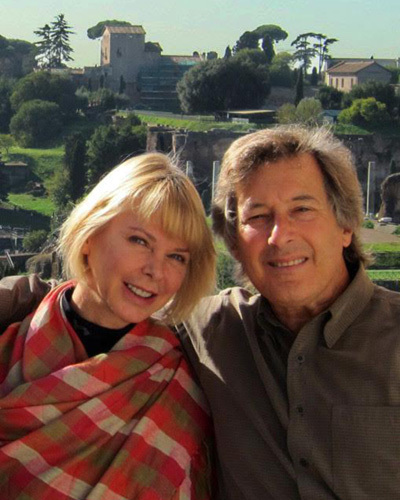 It is a great time to visit the eternal City.